Rakhi which is also known as Raksha bandhan is most beautiful festival of India. It is a symbol of love and dedication to relationship between brother and sister. Rakshabandhan celebrated each year on full moon day of Shrawn month of Hindu calendar. Festival of rakhi is not only famous in our country India but also celebrated as a same feeling of festival around world. Distance between brother and sister can not affect their relationship. If a sister is so far from her brother, than she can send a rakhi to her brother with loving gifts and sweets. Brother also can send various gifts to her sister with love and affection of relationship. There are various ancient and mythological stories attached with this fabulous festival of brother and sister. Relationship between Lord Krishna and her sister Draupadi was one of mythological tale of history. Lord Krishna saved her sister from disrobed in court of Duryodhan. Draupadi tied a strip or bond of love on wrist of lord Krishna. There is another tale of history, Rani Karnawati the widowed queen of Chittor sent a rakhi to Mughal emperor Himayun and called to save her kingdom from a Gujrati king. Himayun go for help her. Festival of Rakhi is beyond distance and difficult circumstances. It is a bond of love in which a sister praises to her brother’s well being and brother give her promise of lifelong protection. Rakhi will be held on full moon day of Shrawan month of Hindu calendar with great enthusiasm. During that time people will involve in shopping of various items such as rakhi threads, rakhi thali, diyas, gifts for their brother or sister, sweets etc. overall Rakhi festival can not be effects with distance or any other circumstances. 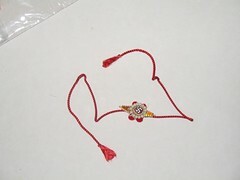 Sister who are living abroad also send rakhi to India for their brother. It’s a time of pleasure and joyous inIndia and around the world too.